This two bedroom, two bathroom cabin sleeps up to six people. 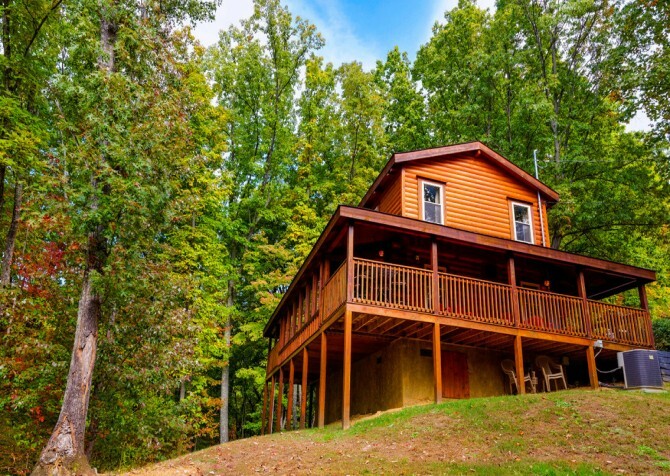 With a short drive to town, lots of games and comfortable interiors, it’s perfect for a family vacation or a group of friends. 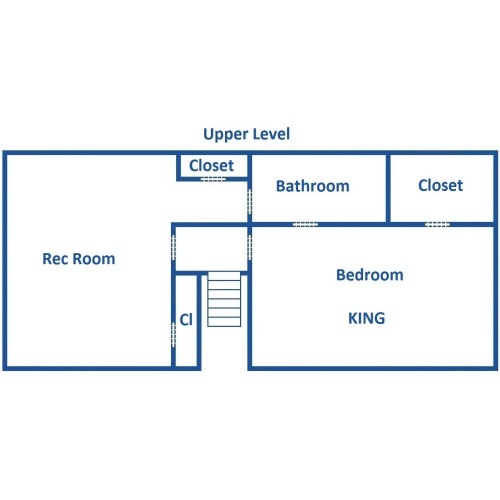 Kids and adults will love all the amenities, and there are plenty of spaces inside for everyone to spread out. Relax, play and enjoy the Great Smoky Mountains. Just 11 miles from downtown Gatlinburg, Jud’s Place is conveniently located to all the shopping, dining and entertainment along the Parkway. Within a 10 to 15 minute drive, you can watch a dinner show, play miniature golf or laser tag, shop at the outlets and boutiques, have a delicious dinner, or just stroll along the bustling streets and explore the city. 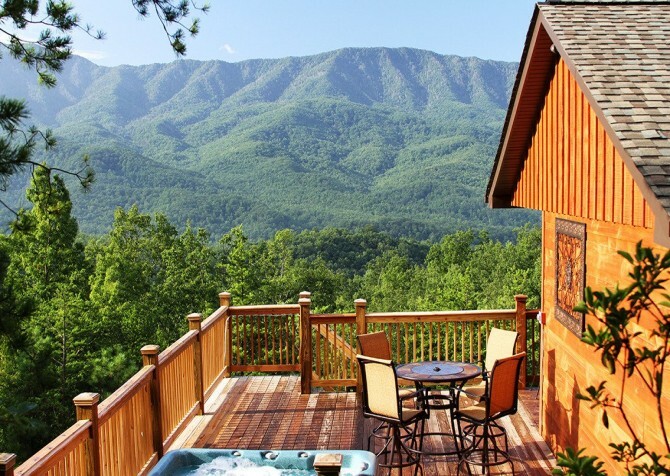 The Great Smoky Mountains National Park, where hiking, biking, horseback riding and picnicking are just a few of the fun things to do, is not far. Other nearby attractions include Dollywood, Ober Gatlinburg and Ripley’s Aquarium of the Smokies. Year round the city’s calendar is packed full of festivals, tournaments, shows and events, so there is always something to do. There are plenty of scenic drives nearby, so you can also spend a quiet day enjoying the sights. 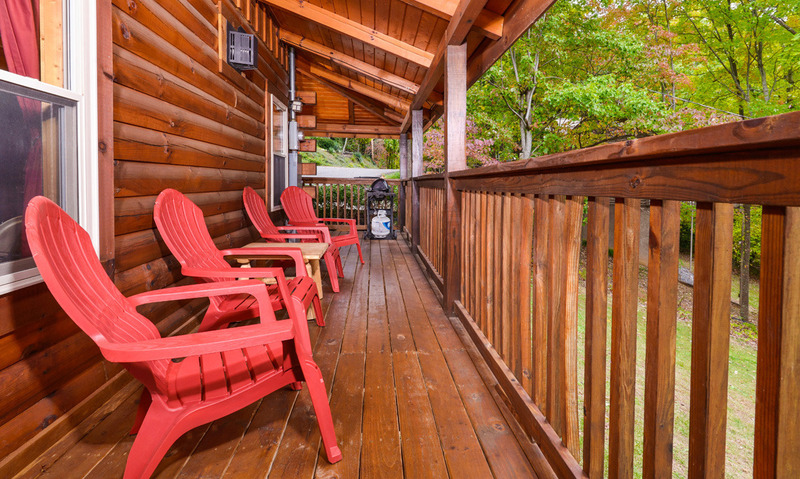 No matter what your vacation style – action packed or peaceful – you can treat yourself here in Gatlinburg and neighboring Pigeon Forge. 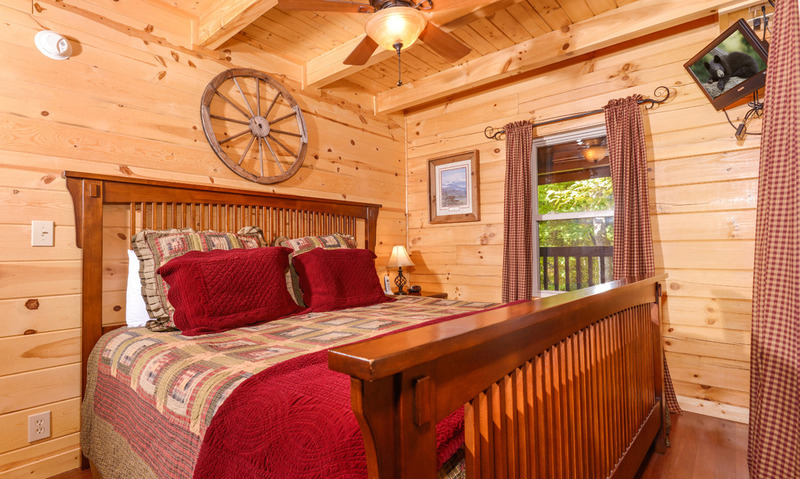 Each of the bedrooms in this cabin features a king size bed. 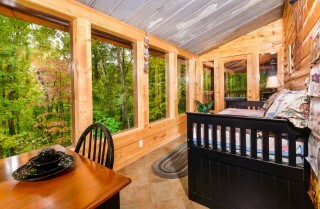 They also have several windows, so you can wake up to wooded views and natural light. In autumn, watch from your bed as the leaves change into vivid hues of red, orange and yellow. 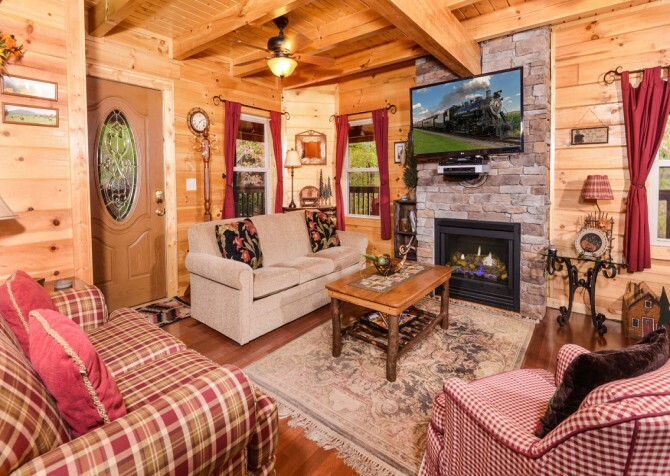 In winter, stay warm while watching the snow fall outside. 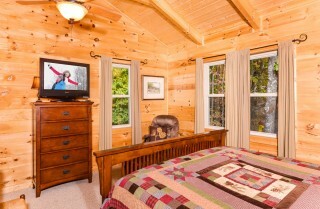 In spring and summer, enjoy fresh greens and bursting wildflowers from the comfort of your own room. There is also a TV in each bedroom, so you can fall asleep watching your favorite shows or stay in bed while catching the morning news. Either way, you will be comfortable and relaxed in your cozy room. 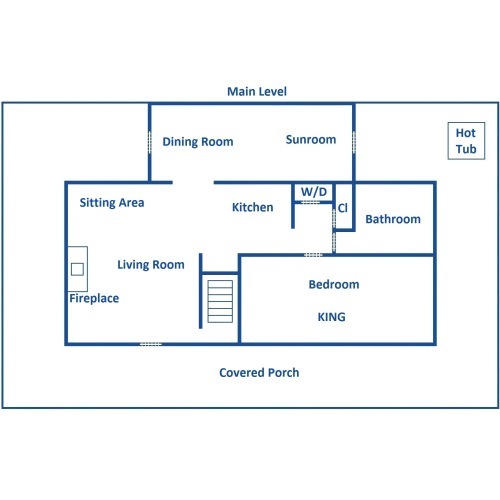 The fully equipped kitchen features black appliances and nice tile floor. You will find all the tools needed for creating your favorite meals, and the dining area is just steps away. The dining area is truly one of the most beautiful rooms in the cabin. There is a large dining table so everyone can eat together, and windows surround the entire room. 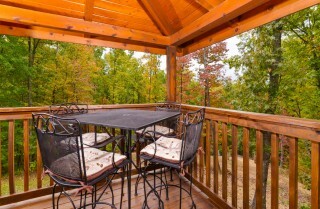 While you enjoy your meal, you can also enjoy the fabulous wooded views. 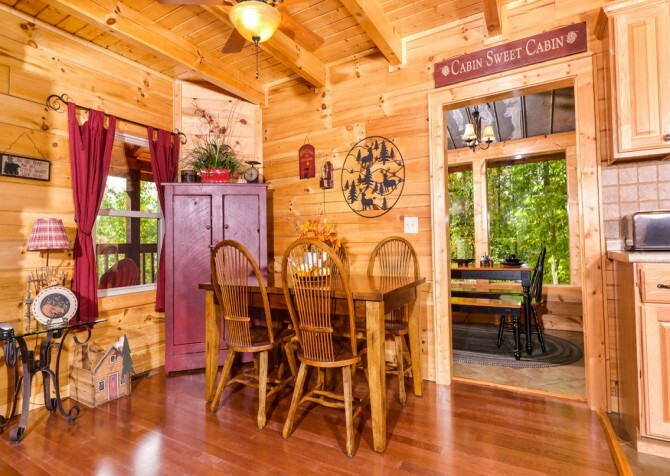 At night, have a romantic candlelit dinner with the starlight peeking through the windows. 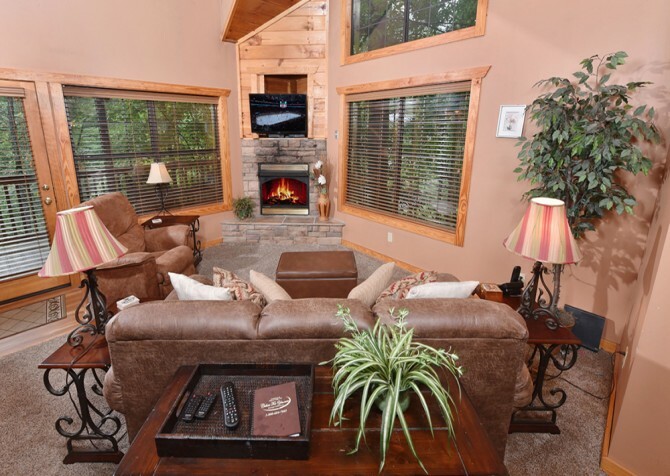 In the main living area, sit back on the comfy couches and warm yourself by the gas fireplace. There are two large couches and plenty of space, so everyone can play games and hang out here. 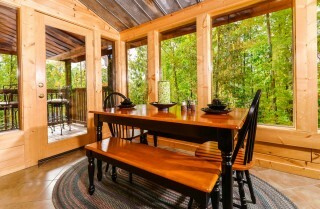 The sunroom has more seating, a lamp for reading, and of course, lots of large windows. With beautiful wooded views, this extra living area is the perfect peaceful spot to read a good book or just relax. 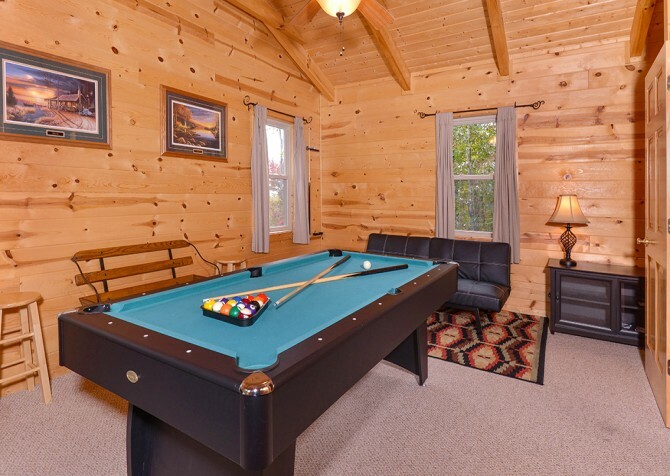 When you’re ready to play around, head to the game room for some fun. 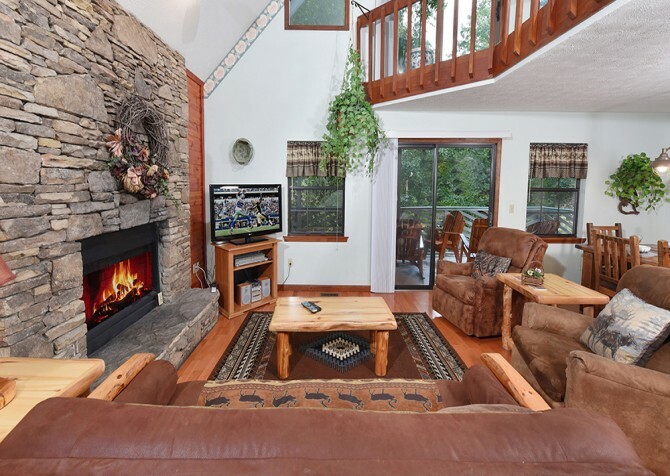 There is a televison, pool table, stereo and plenty of seating. Challenge your friends and family to a game or watch TV and unwind. 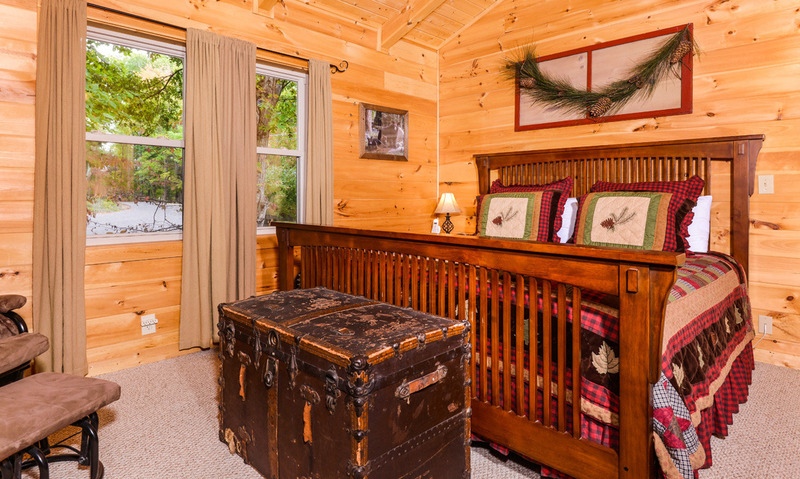 The kids (and kids at heart) will love hanging out here. 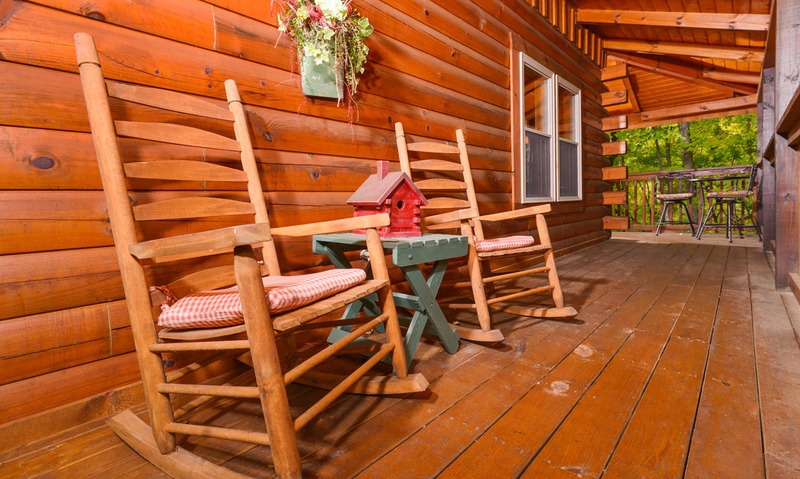 Outside, there are rocking chairs, along with a hot tub and gas grill. 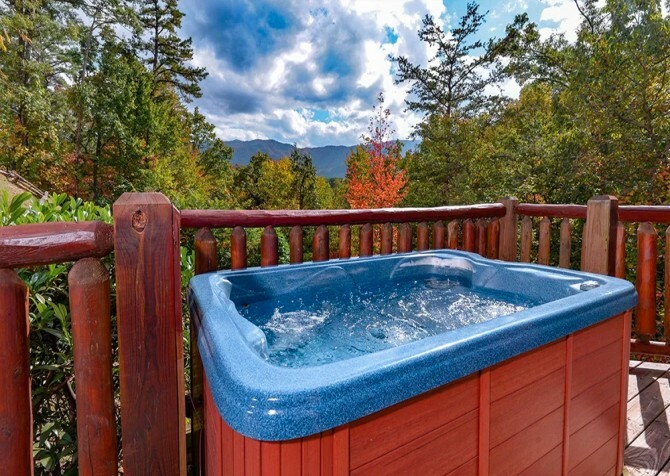 At the end of a long day, take a dip in the hot tub and rest your feet. Grill up some juicy burgers or steaks, or have your morning coffee while rocking on the deck. The hot tub is on a covered deck, so you can enjoy it during almost any weather. 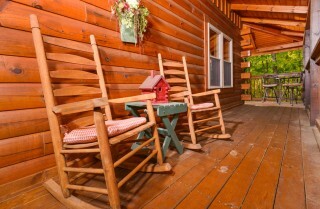 Other amenities here include a CD player, high speed wireless internet, and a flat, paved driveway and parking area. 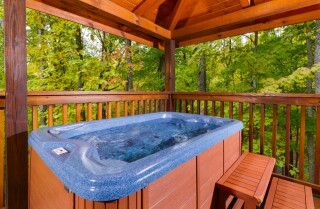 You will also have access to a pool in the Cobbly Nob Resort area. Jud’s Place is a great cabin offering fun, comfort and relaxation. Just pack your bags and enjoy! "Awesome vacation! We stayed at Jud's Place in September 2015. Beautiful, well maintained cabin. 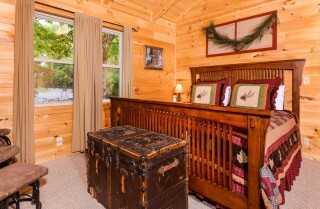 Plenty of room for four adults. We had everything we needed for homemade meals after a trip to the local grocery store. Spent Saturday in Pigeon Forge for the Shades of the Past car show and Sunday walking through and shopping in Gatlinburg. Everything is conveniently located. The only complaint we had was we didn't book a longer stay! Oh well, there's always next year! Thank you!" 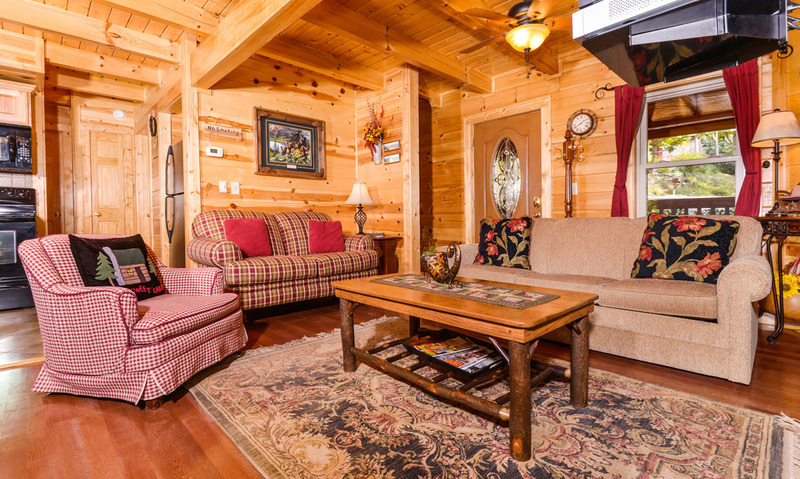 "We stayed at Jud's Place & we fell in love with the Cabin. 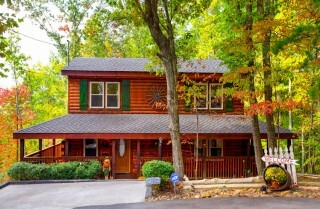 It's in the perfect location there's plenty of activities to do at the cabin , it was clean, no hassle at all and we look forward to coming back to the cabin in the Smokies again! We saw bears the whole time here, in fact as we were leaving, the momma with her two baby cubs were right around the vehicle and in the front of the cabin it was very exciting to see, even the Bears did not want us to leave as they were on the front porch and around the car preventing us from leaving on time LOL. We made great memories here with the bears. 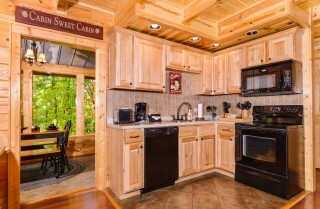 Thank you Cabins for You for our welcome gift."